The idea to make factories smarter has a lot of potential: Eventually, businesses could see centers that make efficient use of resources, integrate technology well and run off of interconnectivity. We can't predict the future, but we can look at some of the factors that will probably shape the factory of the future. Since several trends seem to simultaneously influence this phenomenon, it helps to look at them all together and see the concrete results. These technologies could all be part of the vision of the new, revolutionary factory, based on recent examples. The Tesla car company has defined itself by being at the forefront of technology, so it's not surprising that it's also planning to adapt to new developments. In addition to using tech, the improved factory could also accommodate more work for a higher rate of production. According to an official blog post, the business has big expectations for its growth in the next few years, with a call to produce 500,000 units per year in 2018. To this end, Tesla is reportedly planning to buy Grohmann Engineering, which will add more than 1,000 jobs to the company's German operations, as the company seeks to meet regulatory standards in this country. factories in the first place. Other auto businesses are taking the prospects of the connected factory into account. Audi AG's new plant in Mexico is one example. In September, it detailed the planning that went into this facility, explaining the development. Virtualization allowed the planners to see the process in advance and share details with different planners. Dr. Hubert Waltl, Audi México Chairman of the Board, emphasized this in the company's statement. "Our plant in Mexico is a prime example of the Audi Smart Factory," the professor said. "The facility is the first that we have put into operation completely virtually, that is, in a computer simulation. We have optimized the entire process chain and put the plant into operation 30 percent faster than is usual." 3. Connectivity and the "fourth revolution"
A Robotics & Automation News article about the Audi project made a particular point about the future of new factories, based on the evolution of technology. According to the concept of the "fourth industrial revolution," the next major innovation comes from widespread internet use, which is considered just as important as mechanization, electricity and the first use of computers. Like these other improvements, the rise of connectivity could enable many different other improvements later on and possibly enable future similar industry shifts. It's a broad idea, and it includes both the rise of the Internet of Things and the use of Artificial Intelligence to coordinate operations. 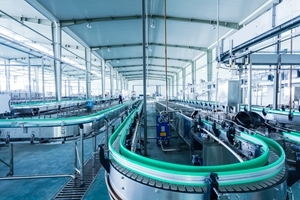 Adhering to this vision could mean several systems within each factory, as well as a connection to other sectors.